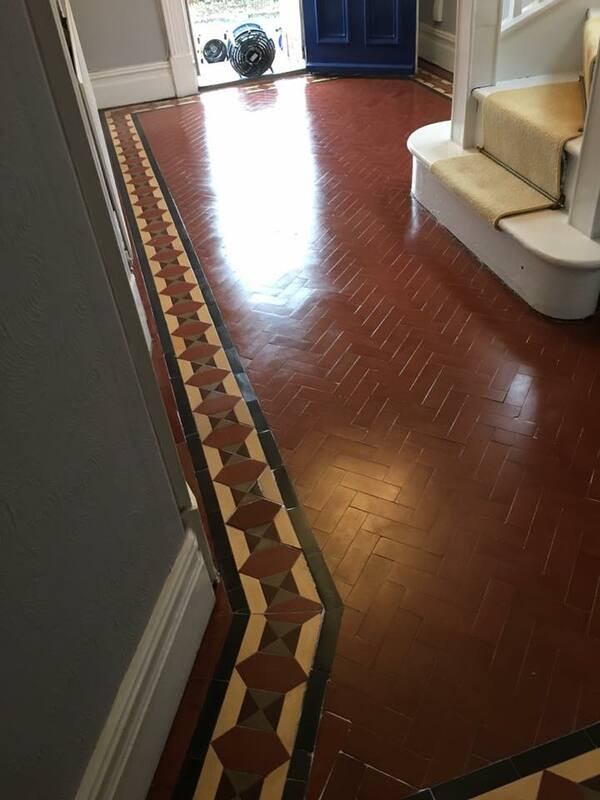 The young couple who owned this house was in Kidderminster were expecting their first baby and wanted the original hallway floor repaired and restored in keeping with the Victorian house. Before contacting us, they had spoken with a builder who had said it was beyond repair and recommended ripping it up and laying a new floor. 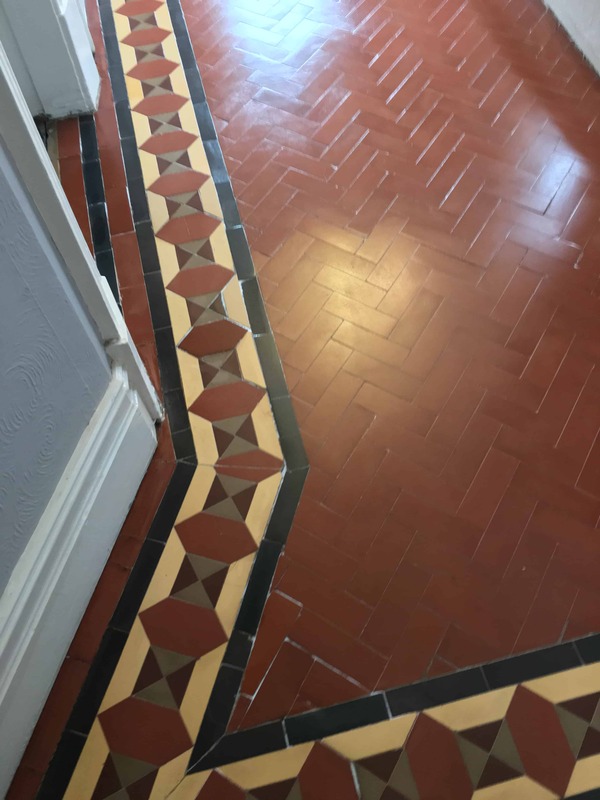 They were aware of the value that original features like floors can add to a property so undeterred they kept looking for a solution and found Tile Doctor. 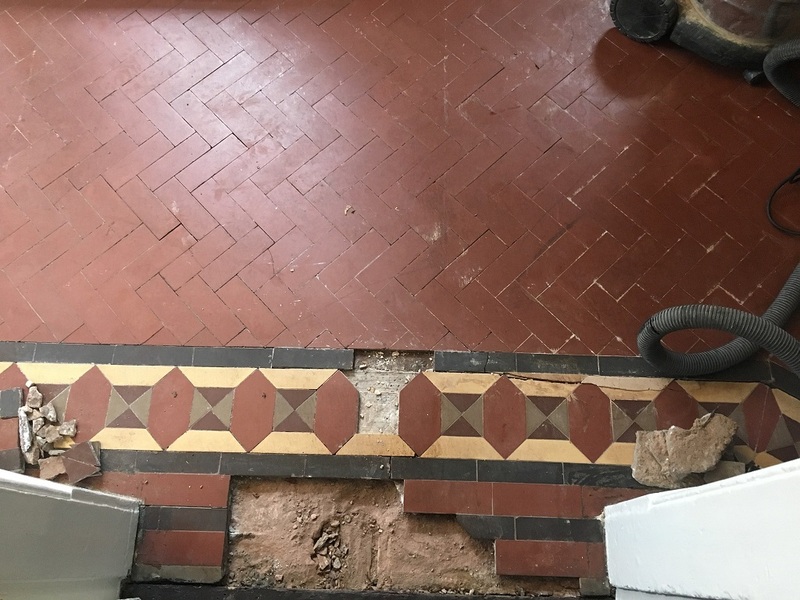 I am the local agent for Tile Doctor in Worcestershire and specialise in the restoration of old tiled floors so after popping round to take a look I was able to confirm that their builder was wrong and there was no reason why the floor couldn’t be restored. Relieved the floor could be restored they happily asked me to do the work and we arranged a date, it also turned out that he was also a fellow Mod and scooter rider, so we had plenty to talk about. 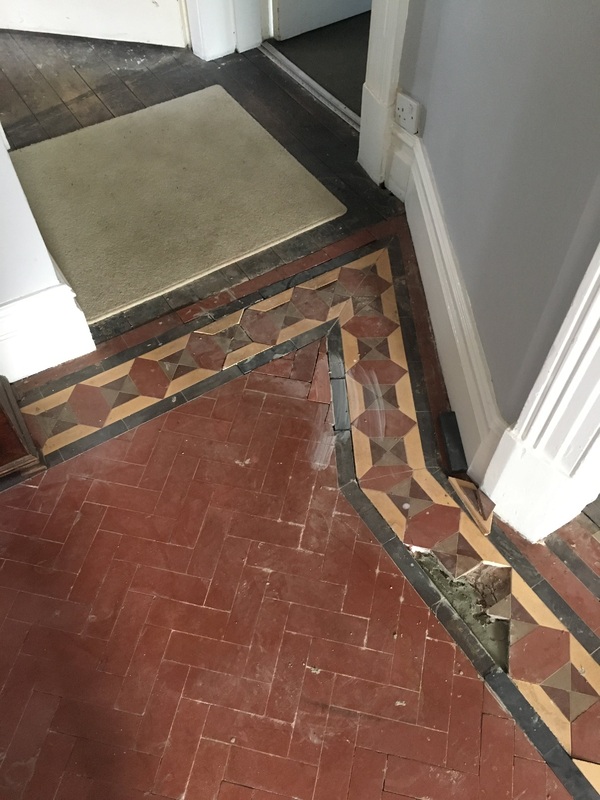 I returned to the property a few weeks later with my tiler and we began the work of carefully inspecting the floor to identify, remove and refit loose tiles. This was followed by repairs to the screed base and then cutting new matching tiles to replace those that were missing. Having worked on old Victorian and Edwardian tiles for some years now I have built up a collection of re-claimed tiles and often scan eBay for them as I know they will come in handy at some point in the future. 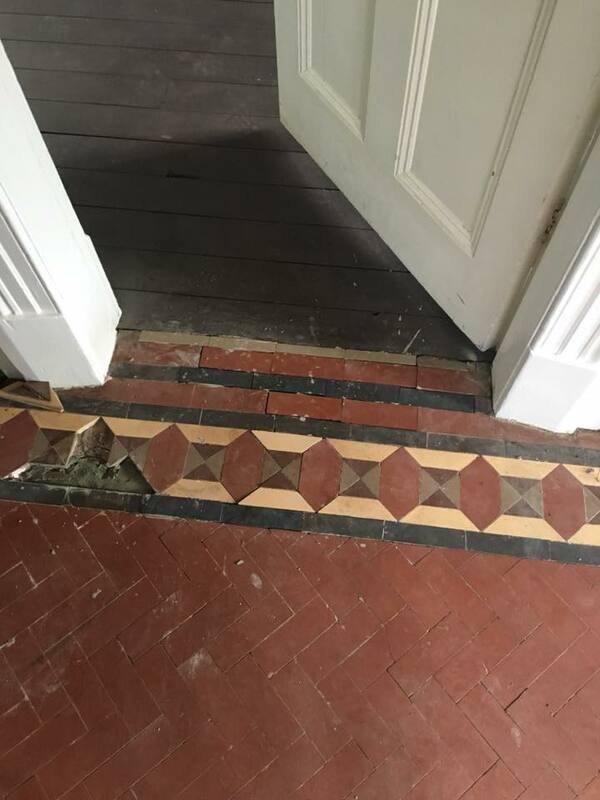 The repair process took three days to complete as naturally each tile needs to set in place and can only be grouted in once the adhesive has gone off. It’s also delicate work as anything out of place in the pattern of the floor would be conspicuous obvious. On the fourth day the tiling work was complete, and I set about giving the floor a thorough clean starting with the application of Tile Doctor Remove and Go to remove any remnants of sealer, paint splashes from decorating and other marks. The solution was left to soak into the tile and grout for ten minutes before being worked in with a scrubbing pad fitted to a rotary floor buffer running on slow speed. The soiled cleaning solution was rinsed off with water and extracted with a wet vacuum, any stubborn areas were then spot treated until I was happy the floor was clear. Using the same process, the floor was then treated to an acid wash using Tile Doctor Acid Gel. This served two purposes, first and acid wash will remove any fine grout smears and second the acid will neutralise any efflorescent salts that had built up in the tiles and could cause issue later. This is a common problem with old floors as they don’t have the protection of a damp proof membrane. The floor was then carefully rinsed down with water applied using micro fibre cloths, so it wouldn’t get too damp and then left overnight to dry off fully assisted with a couple of air movers I had left in place. I returned the next day to seal the tiles checking first that the floor was dry by taking a few moisture readings with a damp tester. The air movers had done the job and I was able to crack on applying numerous coats of sealer which will protect the tile going forward and also enhance its appearance. My choice of sealer was Tile Doctor Seal and Go Extra which is a fully breathable sealer that can cope with moisture rising through the tiles, it also adds a nice sheen to the tile and works extremely well on clay-based tiles such as these. Over the course of the five days the floor was transformed, and my customer was over the moon and I was happy to have saved yet another floor.